Filed to: ALASKA!Filed to: ALASKA! There haven’t been too many environmental bright spots since Trump became the nation’s climate-denier-in-chief, but this weekend offered a rare opportunity to celebrate: Scott Pruitt announced that the EPA isn’t scrapping Obama-era protections that had been keeping a massive open-pit mine out of the world’s largest wild salmon habitat, in Bristol Bay, Alaska. Pruitt’s move doesn’t block the proposed mine from continuing along the arduous application process, but it does keep a series of restrictions hanging over the project, making development less likely. Bristol Bay holds the world’s largest salmon habitat, with over 30 million fish returning from the ocean ever year to swim up rivers to their spawning grounds. This region is the last place on the planet where wild salmon are found in such numbers, and the salmon in turn provide 14,000 full and seasonal jobs, about $1.5 billion in annual revenue, as well as food and cultural significance to the Native Alaskan tribes of the area. While pretty much every wild salmon run in the Lower-48 has been trashed by overfishing or human development, Bristol Bay has been commercially and sustainably fished for about 150 years. This is largely thanks to Alaska’s meticulous fisheries management process, the lack of industrial development in the region and the fact that Alaskans actually care about protecting their environment. And yet the region has long faced an existential threat: rich mineral deposits found directly beneath the salmon spawning grounds. While there are a number of mining claims throughout the Bristol Bay watershed, the one that poses the most immediate threat is the Pebble Mine project: an enormous deposit of copper and gold smack in the middle of the two largest river systems of Southwest Alaska’s Bristol Bay. Northern Dynasty, the company that owns the mining rights to the proposed Pebble Mine, estimates that the deposit holds 107 million ounces of gold and 81 billion pounds of copper, enough to increase U.S. copper production by 20 percent. In 2014, at the urging of fishermen and Alaskan Native groups, the EPA interceded on the Pebble Mine, releasing a scathing scientific assessment of the impacts that a large mine could have on the region and proposing a number of restrictions to the Pebble project. These proposed regulations all but killed the mining project, with stock prices plummeting, major investors pulling out and Northern Dynasty experiencing serious downsizing. But then Trump and Pruitt came to the scene. After meeting with the CEO of Northern Dyansty, Pruitt announced that the EPA would be withdrawing the restrictions it had proposed in 2014, settling a long-standing lawsuit with the mining company. But last Friday the EPA did an about-face, putting the proposed restrictions back on the table. The decision came after meeting with tribal governments, regional stakeholders, and receiving over one million public comments about the conservation of Bristol Bay. For its part, Northern Dynasty isn’t going to give up the Pebble Project (and the $300 billion worth in copper and gold) quietly. Northern Dynasty released a timetable of “project milestones” in September of 2017, which aims to finish the permitting phase and begin construction neatly within the four years of Trump’s first term; they successfully attracted an investor in December of 2017, which brings much needed capital for the application process and development stages of the mine; and the project officially began the permitting process as 2017 came to a close. 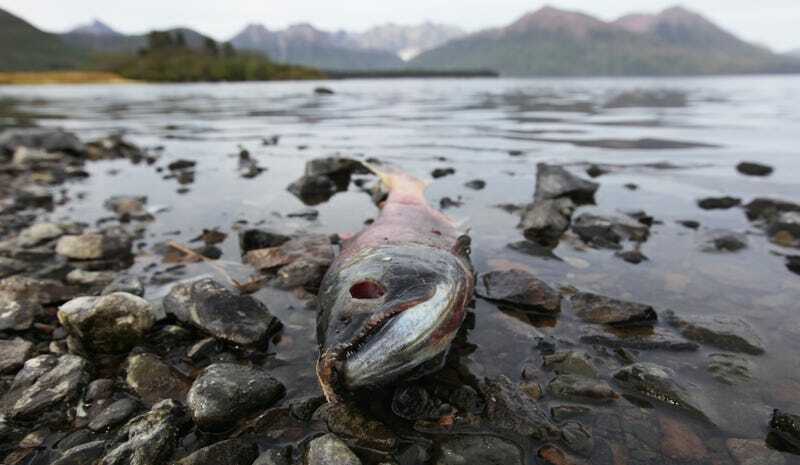 Clearly the fight for Bristol Bay isn’t over. But for once, just once, Pruitt helped rather than hurt the environmental cause. And that’s cause for a little celebration.